The 2 animators (Wendy and Iasmine) made it the best hostel I ever went to! Too bad that Iasmine left, but I'm sure Wendy can keep the good vibe going. Really nice hostel and good service (special thanks to Aaron). We could stay longer in our room and get realy quick loundry service, without extra charge. Go here! 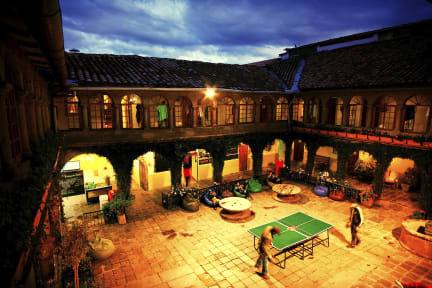 Great hostel in Cusco. Staff was so friendly and the dorms were clean and spacious. Food was decent and breakfast buffet real good. The activities were so much fun and you'd always meet someone to go out and party with. Just don't use their travel agency, it's super overpriced. If I were to go back to Cusco, I'd stay again! Very friendly staff. Nice building with beautifull courtyard. Basic breakfast but good. Music a little bit to loud sometimes. Great hostel! Only thing: maybe add something to the breakfast. I don’t like marmelade and met a lot of people who don’t like it. So the breakfast options aren’t the best.. only carbs. Good hostel, staff could me more friendly. Especially the guys that work here. Prima semi-party hostel, je kan er feesten maar als je vroeg op moet voor een trek is dat ook geen probleem. De ontbijtservice als je om 4 uur s ochtends weg moet is ook lief van ze. The hostel it self looked nice, breakfast is great. Although I thought the vibe was a bit weird. Too much american teenagers who thought about themselves that they are really cool. I don't get why this hostel is so well rated. Its just an OK hostel, but not more than that. Maybe it was just the period we visited it, but didn't really feel a good fibe. Check-in procedure is really long (this could and should be better for a hostel with such rating). Clean showers and toilets, really friendly staff. Breakfast is basic (a lot of sweet). Beds are really comfy. Expensive hostel in my opinion (laundry is also so expensive here!!!). There are better hostels around!